CoSHH Cabinets manufactured in the UK designed to store items classified under the CoSHH regulations. The ‘Control of Substances Hazardous to Health’ (CoSHH) states that items classified should be stored in the appropriate cabinet that corresponds to their classification. Here at Pharmacy Medical, we offer four variations of CoSHH cabinet, all of which can be seen in the below categories. 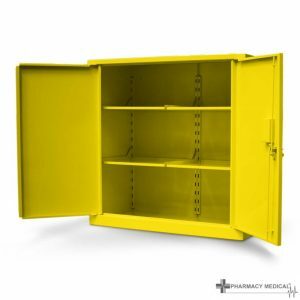 These yellow Cabinets are designed to store flammable and hazardous substances. These white Cabinets are designed to store caustic substances. 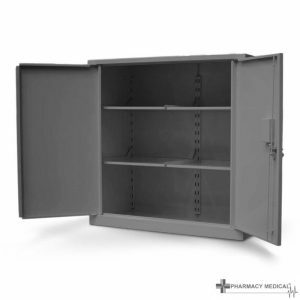 These grey Cabinets are designed to store general CoSHH substances not classified elsewhere. These red Cabinets are designed to store pesticide CoSHH substances not classified elsewhere. Our CoSHH cabinets provide a suitable method of safely storing hazardous substances within the workplace and healthcare environment. Ideally a hazardous substance should be replaced with a safer substitute wherever possible. owver, if this is not feasible then using a variation of a CoSHH cabinet depending on the substance to be stored will ensure you comply with CoSHH regulations. Storing a CoSHH controlled substance in a clearly marked and visible hazardous substance CoSHH storage cupboard will allow better protection, gives greater control over access to the substance and allow better regulation over their use. All our CoSHH cabinets comply with the relevant guidelines set out by the Health and Safety Executive and CoSHH regulations. Dangerous substances and Explosive Atmospheres Regulations (relevant parts). Relating to nominal construction methods for fire resisting CoSHH storage cupboards and storage bins. Highly Flammable liquids and Liquid Gasses regulation (relevant parts). Health and safety Executive guide HSG51 for the storage of flammable liquids in containers.